Scroll down to fill in the shipping address, and credit card info etc. Scroll back up to click “process now” if you are done shopping! Or you can click “continue shopping and then go click on the cart again when you are ready to check out. If you have any further questions, please reach out to your doTERRA support person! I absolutely believe that social circles can come in a variety of sizes! Some people are home with littles and don’t get out much, others are just quieter and keep more to themselves. Others are naturally very social and collect piles of friends wherever they go! You don’t build a business from your friends list. Let’s think about this in terms of a brick-and-mortar business. If you were to open a clothing store, or a restaurant, would you expect to sell clothes or food only to people that you know? “Of course not!” you laugh. Then why do you think you are going to build a doTERRA business out of only people you already know? You might reply “but there is a store front, and people will see it and come to it.” How? You’ll have to do marketing, figure out who you are trying to reach, and find those people. Here is an even better analogy. My parents have been in the restaurant business for over 30 years. They have a store front, and eventually they had their regular customers, and they have a reputation that draws people to them. We can have all of that without the expense of the store front! But, let’s look at where their supplies come from for our analogy. Coffee, specifically. There is a salesman that comes to their restaurant, and sells them the coffee they need. It’s a coffee-shop, so they sell a LOT of coffee. Different salesmen have courted their business, offering different incentives to get them to try THEIR brand of coffee. And Ultimately, my parents have had a long-standing relationship with one company, because they like the product, and they like the service they get. The coffee salesman doesn’t expect only the people he knows to buy his coffee. He has to go find the people who need what he has, and develop a relationship with them. This is perhaps a little more like what we do. We have the world’s most amazing essential oils and company. We have something people truly NEED. (Ok for many people coffee is a need, too which is why I chose that!) Our job is to find the people who need what we have. There are many ways to find people. The first question to very honestly ask yourself is, am I willing to go where the people are? It doesn’t have to feel easy for you to go find people. You don’t have to be an extrovert. You don’t have to have lots of free time. You just have to be willing. I have some seriously introverted builders in my team. I have builders home with 4-6 kids on my team. People who homeschool. People who work full time. None of these things has been an excuse for them to not build. Because they were determined to find the people who needed what they had. Who do you naturally connect with? Who is your natural “market?” Where are those people? Go to where they are. I’ll let you in on another little secret. I always despised network marketing. I had a bad taste in my mouth from people using their church directory to pitch their latest and greatest “opportunity” to me. But you know what is so amazing about this job? We really don’t have to pitch anything. We share. We see a need and we offer a solution. The focus is on the product. And sometimes that solution is an oil, sometimes it is a fun and flexible job that builds a residual income. That’s why I am in this business. I struggled with the label of “Network Marketer” until I watched some of Eric Worre’s training. He talks a lot about how successful people are in the People Business. They just collect people. Who knows what that connection may be for?! They may have something YOU need. It may be Providence. It may be they need what you have. In doTERRA, we are simply in the People Business. It doesn’t matter how many people you currently know; you are about to collect a whole lot more! What else would you say to someone who believes they don’t have a big enough social network to do this business? I recently asked some fellow builders about other thoughts that can be lodged in our minds, and influence our business. Today’s thought comes from their suggestions. This is a pretty loaded comment. By that I mean, there can be sooooo many things behind it. Usually if this comes up in conversation I ask more questions to get to those layers. Do they mean that literally zero people ever attend their classes? Do they mean they seem to not have as many people interested in classes as “other people” do? Do people say they want to come but then cancel? A variety of these scenarios have been behind the statement with different people. We have seen the statistics about the number of people in the US who are open to learning about essential oils. So we know they are out there! Some people are further away from “how do I sign up for this lifestyle” than others. But there are plenty of prospective customers just waiting for someone to offer them a sample. So if we feel like we are not finding those people, we need to look at both ourselves, and the people we are inviting! Are the people you are inviting, people who have experienced oils previously because you shared samples with them? Are you comparing yourself to other builders? ***Some people come into this business having been on a wellness journey for years. And their friends have already come to see them as someone who has learned a lot about natural health options. When they begin to share doTERRA, their friends may be knocking on their door asking them to try their oils. This was my case. My health issues made me a serious student of natural health. Some of my friends had already kind of followed me through some of those steps as I walked my own wellness lifestyle. Don’t compare yourself to anyone else as you start out this business. Or ever! You are building your own network, and you are on your own journey. And you are inviting other people onto that journey with you. Give yourself, and you r contacts, space for your own path, and enjoy the process! Do you have a consistent class offered at least monthly? ***Sometimes there is truly an issue of logistics for people making it to a class. If you are only offering random classes, then when someone IS ready to attend a class you end up having to say something like “oh great! I’ll let you know when my next class is!” Or if you offer a class and it doesn’t work for someone, they are waiting for you to schedule the next one. I try to always have one night the same each month (I have used my home, and coffee shops for this). Then I always have a planned class to invite people to. When someone says “I’d love to, but I have _____ that day” you can always offer the next one. This helps prevent contacts who are truly busy from falling through the cracks. Are you projecting any of your own doubts or issues when you speak with people? ***This is a harder one for people to ask themselves. But if we have any of these thoughts (in this series or not covered yet!) echoing around in our heads, it WILL influence our tone, our choice of words, our energy etc. If you feel stuck in any one of these thoughts, consider if any other thought/mindset is possibly seeping into your interactions with people. Are you living the lifestyle? ***I was surprised the first time I heard a mentor ask someone this question. Aren’t we all in this business because we fell in love with the oils and products?! But sometimes, we get so comfortable, we can sort of stall out in our own wellness journey. I actually like to occasionally do a little “wellness consult” (as we used to call them) for MYSELF. 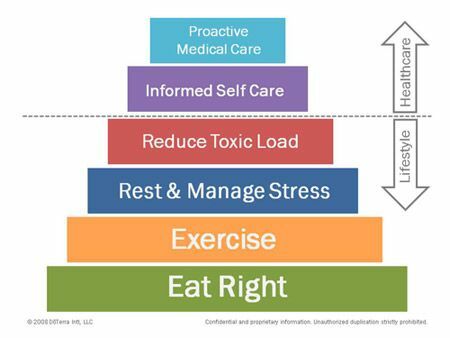 I will rate how I am doing in the various areas in our health pyramid, and see where I need to focus some attention. If we are not experiencing more wellness and our excitement for the lifestyle is not showing, what is going to attract people to it? When I was first starting out in doTERRA, I did not have an upline to train me. I signed up through a friend who lived on the other side of the country, and the next few people above her weren’t really doing the business either at the time. So I set myself to research, and learn anything I could online. I was then joined by my first two builders, and we continued on our own, trying out a TON of different things, trying to find what worked best. There are all kinds of materials, programs, videos, and workbooks available online designed to help people build a successful doTERRA business. I have tried a few of them, and there were things I liked (and didn’t like) about each one. I learned the most from the Edge Success program, and the Share Success programs especially, and while I don’t follow any one program specifically, I took away things from both that I continue to use in how I operate my business and how I train others. The fact is, there are a variety approaches to the business, but success really boils down to a small number of action steps, that get repeated over and over, and that you teach to others. Some training systems call these “rain making” activities. Others call them “success habits.” But they are truly all that will cause your business to grow and duplicate. 1. Who will I share the oils with today? 3. Who has enrolled that I will help better understand the Loyalty Rewards Program? 4. Who is using the product that I will talk to about the business? I have a little spreadsheet that I use to chart my completion of these steps periodically. Anytime I feel like my business isn’t growing the way that I wish, (or someone says that they feel stuck in their business), I go back to these Daily Success Habits. It includes income earning activities, and personal development activities. I was once in a challenge led by my amazing upline, and we used a tracking sheet, and I was hooked! Below is my modification of it that I use for myself. Tracking these activities for a week or more really gives me a clear idea of where things are at, and what area I might have been missing that needs to ramp up in order to keep growing. It is easy to start spending more time on the personal development side, and not even realize it, until you track how you spend your time! And while personal development is key to becoming a better and successful leader, it doesn’t directly earn you any income. This list helps me see if I am keeping things in balance. Do you have a system you use to track your business activities? I know that most people begin sharing DoTERRA because they want other people to experience what they did when they tried the oils. Their goal is to help people. Getting paid for it sometimes feel like a bonus at first! But we do need to be aware that our fear of being salesy may prevent of us from helping people find what they are looking for. So let’s not be afraid to learn about sales, and ourselves, so we can help the most people possible! As I got started in this business I did a lot of reading, online and in books, watched a lot of training videos, and tried to learn from successful people in doTERRA and in other businesses. And a lot of what I read was about the psychology of sales… what steps do people go through to make a purchase, what makes them decide to buy a product etc. I won’t share that all here; google away and enjoy! But the most common thread I read in sales psychology, is that while people learn about your product with their logical mind, they make the choice to purchase from the emotion center of the brain. They don’t buy a product; they buy how they hope to feel when they use the product. People are looking for a change, and we are offering them that change. People are looking for education, and we share our knowledge, and continue to learn alongside them. People are looking for support, and we show up for them. People are looking for community, and we welcome them in. People are looking for options, and we have what they need. Truly, we are not selling a product, we are “selling” a lifestyle. We are sharing our own stories, and inviting people to join us on the wellness journey. If you are interested in linking arms with people of similar goals and passions, in helping and encouraging one another to make healthy choices, and sharing the knowledge you learn, then you are not being salesy. You are showing up to serve. Whoa. Hold the phone. My friends wanted me to benefit. They wanted what I had shared with them, and wanted me to benefit because I shared with them. Lesson Number One: Give your friends more credit. I once taught a class in a town with around 800 people in it. Pretty low in come area. I was sure most people would feel they could not afford the oils, let alone enrollment kits. My friend had 7 people come, and 5 of them enrolled with a kit. Lesson Number Two: Don’t assume you know what people can afford. Wait, what?! If they don’t end up with oils in their homes, how did I help them? If they run to Walmart to buy cheap oils and try to use them like my oils, how did I help them? Lesson Number Three: I am only really helping them, if I help they actually end up with the oils in their homes. On their own time table? According to their own needs? Yes! Have you ever noticed a thought that got stuck in your head, that was influencing how you built your business? Share it in the comments, so we can all encourage each other in grow! I wanted to share some thoughts with you all on this concept of “growing organically” in your business vs “pushing”. This is something I have heard pretty often in doTERRA, these two phrases, and I’ve been pondering what that means, and how these phrases might be influencing how we approach our businesses. What does that mean exactly? I think what people THINK they mean, is that they are not being PUSHY. They are not chasing people down trying to get them to try the oils. But sometimes when people say “I am not pushing the business, ” what I really is I see people ACTING like “growing organically” means something more like Wishful Thinking. They are waiting for someone around them to say “hey, I want to know more about your oils!” That isn’t really growing organically. That is hoping for a lucky break! To grow organically, involves prepping the soil, planting seeds, tending the seeds, weeding the garden, harvesting etc. It is all still done ON PURPOSE. You get to choose the size of the garden… how big a garden do you want? How many seeds will you plant? How much time do you have for cultivating it? You can choose to have a smaller garden, or to expand it very slowly over time. But it’s still all going to be on purpose. Sometimes I will talk about “pushing” in my business for a block of time. This doesn’t mean I am chasing people down, calling people I haven’t spoken to in ages asking if they want some oils! This means I have increased my pace/time being spent on the business. I am teaching more classes than usual, I am doing special events, I am mentoring more people than usual. It’s a decision to work harder for a period of time, in order to help create a burst of growth in my business. I am more attentive to “who around me needs oils?”, to the people that cross my path. I create more opportunities for conversations about oils. I stretch myself more outside my comfort zone in offering to meet that need sometimes. But it’s still not pushy. It’s what I normally do, only MORE. I am expanding my garden. I am enlarging the field, planting more seeds, and investing more time than normal in the tending of it. You get to choose the size of your garden. Just remember the business only grows by CHOICE. Don’t let “growing organically” become an excuse to not do the business on purpose, on whatever scale is perfect for YOU at this time. Don’t trick yourself into “wishful thinking” with that label. How big a harvest do you want? How long do you want to take to get there? Do you ever run in to this misunderstanding? Push vs Pushy? Have some encouragement to share with others? Join the conversation in the comments! There are so. many. details. to this business. And then each year there is a change or two, or more, as doTERRA grows and adjusts to that growth. It is a TON for a wellness advocate to keep in his/her head! So today’s blog post is a landing page for frequently asked questions, things we all need to go back to and reference from time to time, or to share with a new builder. Often a spouse will begin to catch the excitement of building a doTERRA business, and decide to join us! To share the recognition for rank and income, you need to complete a new Wellness Advocate form, with both names on it, and an account information change form, and submit it via email to: dataentry@doterra.com. When do I get my Points for my LRP orders? When do our paychecks process? FAST START CHECKS: Fast start checks process WEEKLY. The pay period runs Sunday to Saturday, and the checks print/deposit the following week. (Fast Start bonuses are the enrollment bonuses earned when you enroll someone new with a Wholesale Customer, or Wellness Advocate account. I.E. If you enroll someone on a Tuesday, that check (paying you 20% on the PV of their order) would process the following week. Anything that new person orders in their first 60 days, will earn you further Fast Start Bonuses of 20% on those orders as well. UNILEVEL/POWER OF 3/RANK BONUS CHECKS: The regular monthly commissions (a.k.a. UNILEVEL earnings) process on the 15th of the FOLLOWING MONTH, as well as all rank bonuses. I.E. Any regular/unilevel commissions from the month of January between 1/1 and 1/31, power of 3 bonus from January, and rank bonus from January, would ALL be paid in one check on FEBRUARY 15th. How Do I Use My LRP Points? How do I change the SPONSOR of someone I enrolled? DoTERRA gives us 14 days to move someone off of our front line when we enroll a new Wholesale Customer or Wellness Advocate. The video below will walk you through the steps. NOTE: When you enroll someone you CAN enroll them directly into the spot you want them to end up in, but entering in YOURSELF as the enroller, and then putting in the name of the desired SPONSOR in as well. I like to do this, because if something comes up and I want to change my mind, I still have that 14 days to move them elsewhere. By always having my Power of 3 sheet filled out, and tracking my rank goals, I know where I need someone to be. Ask your mentor any questions about placements! If you have any other questions that frequently come up, let us know and we’ll add them to this list! I am so excited to introduce to you my new blog and website, The Whole You! (TheWholeYou.biz) My husband-and-business-partner Rich has been working hard behind the scenes getting things set up for me, and I am loving seeing it all come together! I’ve been itching to write for a while, but struggled to figure out where and how, as I have my fingers in a variety of different pies, as always! I found myself initially prepping blog posts about doing the doTERRA business (one of my several passions). I was so torn about an area of focus, because I love so many things. Then one night, I was reading in The Big Leap, and something really struck me that made me think about “the whole you,” all of the facets that make me who I am. And I realized I need to write about ALL of it! So, here is the home of my new business blog, where I will write about my thoughts and things I learn about building a DoTERRA business, sharing essential oils and other products that have helped my family and many others. I also look forward to hosting some great business training for my amazing Diamond Calling team in this space! I hope you will join me in pursuing health and wellness in all areas of life together in 2017 and beyond! Be sure not to miss future blog posts pertaining to doing this amazing business called DoTERRA! Subscribe here!